I'm sure you are familiar with the old parental lament, "If only kids came with an instruction manual!" Wishful thinking, right? Or is it? What if parents could work together with a team of experts to develop such a manual for their child? They could review the child's strengths and weaknesses, the parent's concerns, and the child's needs and formulate a plan, including instructions, to enable the child to be successful. Sounds pretty good, doesn't it? Well, that's the general idea behind the IEP or Individualized Education Program; although, as many parents who have been through the IEP process are aware, this is usually much easier said than done. For many parents, the prospect of attending an IEP meeting (ARD meeting here in Texas) and actively participating in the development of the IEP can be a bit overwhelming - but it doesn't have to be! 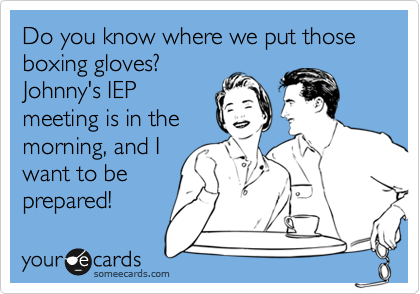 The key to a successful IEP meeting is to be prepared. First, make sure you have all of your child's records together including medical records, reports and communications from the school/district and any evaluations completed. If you don't have them, request them in writing. • Beginning prior to the student turning 16, postsecondary goals and transition services designed to help meet those goals. • Special factors, when appropriate, such as behavioral issues, limited English language proficiency, communication needs, the need for Braille for the blind or visually impaired and/or the need for assistive technology. I know it seems like a lot of information to cover in one meeting. This may lead many parents to wonder, "Shouldn't these decisions be left to the experts? How do I know what services or accommodations to ask for? What should the goals be? Are my expectations too high or too low?" Let me answer the first question with another question: when it comes to the needs of your child, who is more of an expert than you? Always remember, you are the only member of your child's IEP team with only your child's best interests at heart. As to requesting the right services and formulating goals, there are many sources available to assist you. • Review your child's most recent evaluation. It should help identify areas of strength and, more importantly, areas of need to be addressed. • Research your child's disability. What evidence-based practices, treatments and therapies have proven effective? • Check out websites like Wrightslaw and the Center for Parent Information and Resources. They are great resources and provide a wealth of information. • Find a support group for parents with your child's disability. Parents often share their experiences and what types of services have proven successful (or unsuccessful) for their children in the past. • Talk to your child's doctor or health care provider. • Talk to an advocate. An advocate can review your child's records with you and help you prepare for the IEP meeting. Your advocate can even attend the meeting with you if you'd like. At least once each school year, the ARD Committee must meet to review how things are going. Did the child achieve the goals set? If not, why not? Does a change need to be made? If the goals were achieved, the IEP should be revised to include new and challenging goals. Is it time for a reevaluation (at least once every three years!)? Do you, as a parent, have any concerns you would like addressed? Keep in mind, if you do have concerns, or if you feel your child is not making sufficient progress, you do not have to wait until the annual meeting to address them. You have the right to request an IEP meeting at any time. You will want to prepare for each subsequent meeting in the same manner. Stay on top of things! If you do, you will ensure your child has the best possible chance for success.